You don't need any technical knowledge of any of the tools in the BITlab, that's what I'm here for! If you would like to learn some things through the process, I'm always happy to teach you, but don't worry that you don't know how a 3D printer or Laser Cutter works... you don't need to. K-12, any content area or subject matter, even non-academic projects. In addition to great class projects, we have had advisory groups make secret Santa gifts and teachers make Halloween costumes. Tools and help using them are available to you. You may have a specific project in mind but if not, we can design one together. You only need to know what content you want your students to demonstrate in their final product. Worried that your project will take too much time? Let me know what your time frame is and we can design a project that fits. When you use a project to replace a test, you can turn your prep day, test day and correction day into an engaging project for your students. You can teach a unit through hands-on activities. Analyze a concept by building an object. Demonstrate a series of events by making an electrical circuit. Think about a time period by designing a game. These projects challenge students to think, analyze and reflect in ways that most test questions don't. If you are interested, feel free to email me with any questions or ideas. Check out some of the recent projects below for inspiration! Laura Nutter's food science class was studying sugar solutions, so I showed them how to create custom lollipop molds with an online 3D modeling program called Tinkercad. We then 3D printed them to make trays. Students created their solutions and made their lollipops. 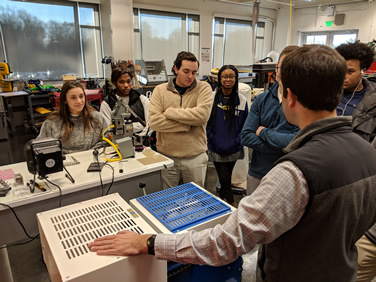 The BITlab tools allowed students to personalize the project to add an extra level of engagement to an already fun project. Students in Emily Simpson's Math class were given a list of mathematical relationships and formulas to use in designing a logo based on their initials. Using things like line segments, parallel lines, bisected angles, etc. students created a design on graph paper. They then came to the BITlab and recreated their design on the computer so it could be cut out of wood with the laser cutter, giving them a unique takeaway from the project. How do you "Show" people the extent of the damage that was caused by hurricane Maria? What kind of object can you create to allow you to discuss the effects of the storm and where the people of Puerto Rico should go from here? 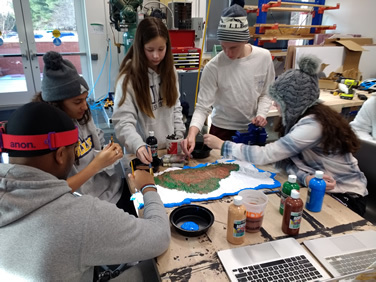 Bryan Whitford's class created three topographical maps, carved from a digital file on our Shopbot, which they then designed to reflect their research and thoughts on these issues. Using paint, 3D printed objects and a lot of collaboration between two different sections, the students created objects which they used as a reference for the spoken part of their grade.